My two favorite things for summer parties are pitchers of sangria and margaritas. They are hard to beat for a cold, refreshing drink to share with friends. 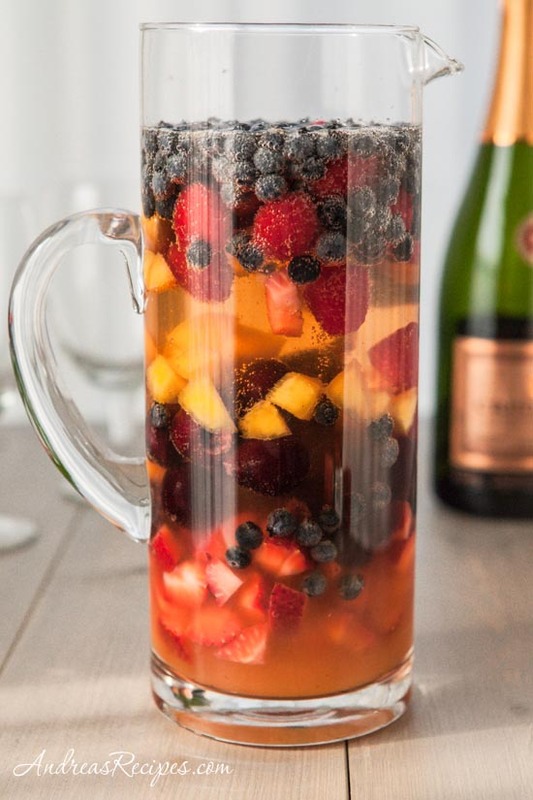 This sangria is perfect for summer parties and adds a pitcher of deliciousness to your Fourth of July cookout, and it’s easy to make. Just put all the fruit and brandy in a large pitcher and chill for a few hours. Then stir in peach nectar and chilled Cava, a Spanish sparkling wine that is widely available and relatively easy on the budget. Serve it over ice and you are ready for Fourth of July food and fireworks. The original recipe from Cooking Light calls for nectarine nectar, but since we couldn’t find it anywhere we substituted peach nectar. Frankly, I thought the peach nectar was fantastic and added a bit more, about half a cup, to complement the dry Cava, but feel free to use more or less to suit your taste. 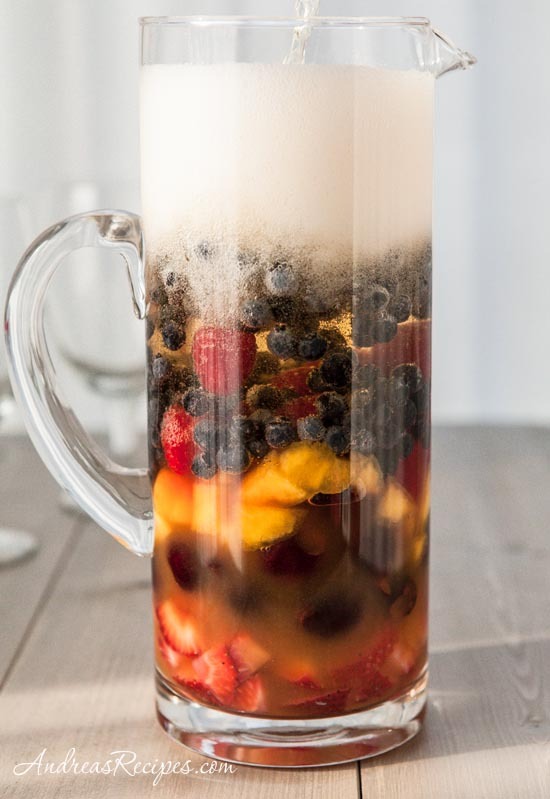 Combine the strawberries, cherries, nectarine, blueberries, raspberries, and brandy in a large pitcher, and chill for at least 2 hours. Stir in the peach nectar and cava. Serve immediately over ice. Yummy, and super pretty all summer. I use orange liqueur (Cointreau or Gran Marnier) instead of the brandy and I like that even better. Thanks for sharing this recipe and gorgeous photos! YUM! this looks absolutely delicious and far to easy to over indulge with!